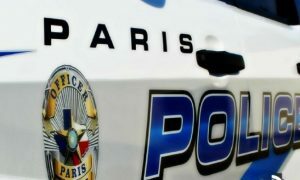 Wednesday morning, Paris Police worked an identity theft in the 5100-block of SE Loop 286. Reportedly an unknown suspect had used the identifying information of another to conduct a financial transaction. The investigation is ongoing. Officer worked a burglary in the 800-block of W. Cherry. An unknown suspect had entered the building and took several items including a washing machine and an air conditioner unit. The investigation is ongoing. Officers worked another burglary in the 500-block of SE 6th. An unknown suspect had entered the residence and took a computer tablet. The investigation is ongoing. A victim reported his firearm missing in the 800-block of E. Washington. An unknown suspect had entered the complainant’s vehicle at an unknown location and took a .9mm handgun. The investigation is ongoing. Paris Police responded to 88 calls for service and arrested three people over the past 24 hours ending at 6:00 am Thursday (Jul 19).